Each Tuesday morning, a team of very special volunteers arrive at the oncology unit at Emory Saint Joseph’s Hospital. It’s not unusual to see a Golden Retriever, Brittany Spaniel, Labradoodle or another adorable breed walking down the hallway and entering patient rooms. Accompanied by their owners, these four-legged volunteers from Happy Tails Pet Therapy bring comfort and healing while brightening the day of patients and staff. “These animals provide unconditional love and acceptance to ease the pain for those patients who miss home, their family or pets,” says Heather Dexter, CEO of Emory Saint Joseph’s. Oncology patients eagerly anticipate the animals’ weekly arrival, and those requesting a visit from Happy Tails have a paw print placed on the door of their room, a welcome sign for the handler/pet therapy teams to enter. For the past five years, volunteers from the Happy Tails program have provided a welcome distraction for patients undergoing chemotherapy or radiation in the hospital’s Winship Cancer Institute. Patients quickly bond with the dogs and often schedule their treatments around the Happy Tails visitation schedule. With the popularity of these visits to the outpatient center, the hospital saw a need to expand the program to Emory Saint Joseph’s inpatient oncology unit. “Our nursing leadership team really championed this move to make Happy Tails part of our patient care team,” adds Dexter, whose own initial experience with Happy Tails was as a family member of a patient. 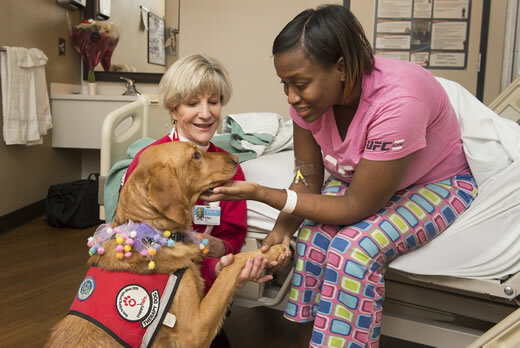 While the Happy Tails dogs form a unique bond with Emory Saint Joseph’s patients, so do their handlers. Ellen Griffin, facility coordinator of the program at Emory Saint Joseph’s, and handler/volunteer Eleanor Hager, have several reasons for giving back to these patients. Hager shares a special connection with patients as a cancer survivor and she and her dog Kody put patients at ease during their visits. Griffin has volunteered for several years with all of her personal pets, and regularly brought her dog Dooley – a cancer survivor – to visit with patients before he passed away. For more information about the Happy Tails pet therapy program, call the Emory Saint Joseph’s Volunteer Services office at 678-843-7292.